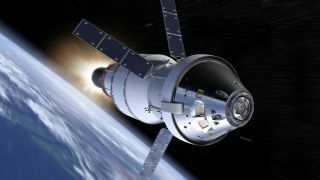 An artist's impression of the Orion capsule in space. CAPE CANAVERAL, Fla. — NASA will take about a month to assess how much extra time, money and risk would be added to the debut flight of the Space Launch System (SLS) rocket if a two-member crew were aboard, officials said today. "I felt that if we went much beyond 2019, then we might as well fly EM-2 and actually do the (plan) we're on," Gerstenmaier said. "This study will determine how much additional time is needed … to add crew to EM-1," Gerstenmaier said. "We will definitely have a [later launch date]. We also recognize we'll need to add some additional funding." NASA's independent Aerospace Safety Advisory Panel said in a meeting Thursday (Feb. 23) that the reasons for having astronauts fly on EM-1 must be compelling enough to override the additional cost, schedule and safety risks. "We are not proposing what the outcome of NASA's assessment should be," Patricia Sanders, chairwoman of the Aerospace Safety Advisory Panel, said during the meeting. "But in the assessment, we strongly advise that NASA carefully and cautiously weigh the value proposition for flying crew on EM-1." Flying astronauts on a rocket's debut flight would be a departure from NASA precedence. Only one previous spacecraft, the space shuttle, made its first flight with crew aboard. "The space shuttle really wasn't built to be flown unmanned, and we would have had to do an awful lot to make that happen," former astronaut Bob Crippen, the pilot on the first shuttle flight, said in an interview with Space.com. "This is still pushing the envelope in some areas, but it's not as big a step technology-wise as what we actually did in the case of the shuttle," he said. "We will be very cautious about what we go do. We will do the right thing." Editor's Note: A previous version of this article incorrectly stated that the first space shuttle flight was launched with a Saturn V rocket; this was a mistake entered by the editor.